Bernard L Bilski is certain to be a name that will long be remembered in patent history. A world class speaking faculty of IP thought leaders debated with delegates from around the word at the third IP Business Congress, held this year in Munich. Creating value from IP and other intangible assets was the theme of the event, and what is abundantly clear is just how many possibilities there now are to do this for those willing to think creatively about what they own. Strategic thinking on the creation of IP value tends to focus on patents. However, those who open their eyes will find enormous potential, as well as major challenges, in what copyright has to offer. The Supreme Court’s recent decision in the Bilski case should encourage US patent owners to undertake a systematic audit of their portfolios. Failure to do so could end up being an expensive mistake. The CIPO Manifesto Working Group held its second meeting at the IP Business Congress in Munich. Its focus was on identifying best practices in IP value creation. 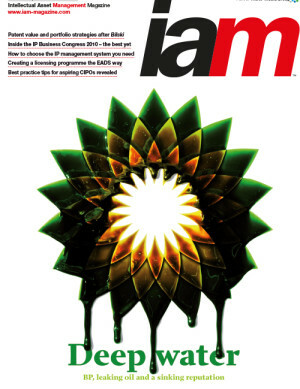 Although BP was aware of the importance of its corporate reputation, the company's internal processes have not helped it to weather the political and regulatory storm unleashed by the Deepwater Horizon disaster. We are entering the intangibles decade. At a meeting held earlier this year, experts from a range of disciplines predicted what this will mean. The purchase of IP management system software is a significant investment. So how do you decide exactly what you need and who is best placed to meet your requirements? Four years ago, Europe’s top aerospace company decided it should be making a lot more of its IP portfolio. Now it is beginning to roll out a sophisticated licensing programme. In this article, some of those involved in developing it explain how it was done. It's a three-step process to persuade a company that it can prosper and grow through investing in intellectual asset management. Recent decisions in the US and Europe concerning the patentability of software and business methods may have provided greater clarity, but they have not brought further harmony. This has significant implications for portfolio management strategies. Intellectual property is an asset that can create real value for the businesses that own it. But convincing a board of directors that this is so is not always easy. Chief IP officers from a variety of companies explain how they did it. Understanding patents starts with a business’s ability to identify needs, establish expectations and measure performance. It’s easier said than done, say three experts. The recent ruling in the Solo Cup case provides some insight into what US patent owners can do to protect themselves from false marking claims. On 12th July, US President Barack Obama wrote to Nancy Pelosi, Speaker of the House of Representatives, requesting that she spearhead efforts to ensure additional funding for the US Patent and Trademark Office (USPTO). A December 2009 deal that Micron Technology did with an NPE exposes issues that go to the very heart of corporate IP management.